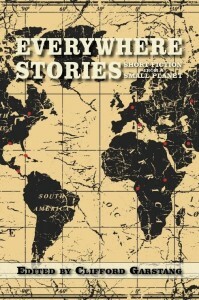 My new book, Everywhere Stories: Short Fiction from a Small Planet, is officially published this week, on October 1. On October 3, we celebrate with a launch reading and party, including several of the contributors to the book. It’s really a good book and I’m proud of it, but getting the word out is exhausting. I’ve been down this road before. When my first book came out in 2009, In an Uncharted Country, I had a small gathering at a local café. People came, had a drink, ate some food, bought the book and had me sign it, and went home. I tried to arrange some readings and asked people to review it, but there honestly wasn’t much activity around it. I hired a publicist—rather late in the game—and while she got me a few more readings, there still was little buzz. It’s very hard for a small press author to get noticed, and for a short story collection it is even harder. The second book came out in 2012, What the Zhang Boys Know. I felt even stronger about this book—I had managed to get an agent for it, although she wasn’t able to sell it to big presses—but the story was pretty much the same. I arranged some readings and tried to get some reviews. I hired a “book blog tour” service that got the book mentioned on a lot of websites—most of them very unprofessional reviewers. (“I don’t think I’m smart enough for this book,” said one of the bloggers. Um, yeah, maybe.) I engaged a book club service to get the book in front of book clubs. Neither of these two expensive moves did any good, as far as I can tell. I ended up giving away a lot of books, and selling few. No mainstream book review outlets wrote about the book, and neither did the big-name book blogs. I did get some interviews, mostly in pretty obscure places. The book is set in Washington DC and we tried to get all the Washington magazines and papers interested, but no one paid any attention. I thought things might change in 2013 when What the Zhang Boys Know won the Library of Virginia Literary Award for Fiction, but they didn’t really. There were a couple of articles about the award in Virginia papers, and my local paper ran a feature, but that was it. Zero reviews. But this new book is different, and that changes both my approach and my expectations. First, I’m the editor, so I’m not keen to set up readings, which don’t sell a lot of books anyway. After all, it’s not my fiction, so it would be weird for me to read from it. If I can set them up and get contributors to participate, that might work, and we’ve got a few of those in the works. Second, because the concept is different, though, I think the book is attracting more interest from reviewers. I’ve already done several guest posts on blogs, including short interviews. I just did an interview on a radio program, Rudy Maxa’s World, that should have given us a lot of exposure. And we’ve heard from several magazines that reviews are in the works. Third, I think this would be a really good classroom book. It’s not exactly “World Lit,” because almost all the authors are Americans, but it does give the reader good insights into the cultures of 20 countries, and I think that’s big. We’ll see. I don’t think promotion is any writer’s favorite part of the publication process, but right now it’s taking up a lot of my time and energy.